During the 1926-27 academic year, William Carlson Smith joined the UH faculty as a visiting member. Smith was a good fit for UH’s Sociology Department. In the 1920s, Smith worked as a researcher on the Survey of Race Relations with Robert Park investigating “relations between Orientals and whites on the Pacific Coast” (Tentative Findings of the Survey of Race Relations. Stanford University: 1925). While at UH Smith taught the introductory course and one on the family. He asked students in these courses to write autobiographies and somehow arranged to have students in Hawaii’s secondary schools write autobiographical essays as well. The Guide to the William Smith Papers 1924-27, housed at the University of Oregon, lists a prodigious number of essays not only by UH students but also by students from the Normal School, St. Louis College, McKinley High School, Mid-Pacific Institute, the Japanese High School on O‘ahu; Hilo High School, Honoka‘a junior and high schools and Laupahoehoe on Hawai‘i; and Lahainaluna and Maui high schools on Maui. At least two of Smith’s books must have drawn heavily upon what students shared with him: Americans in Process: a Study of our Citizens of Oriental Ancestry (1937) and Americans in the Making: the Natural History of the Assimilation of Immigrants (1939). The Smith papers are particularly valuable because they capture the voices of first generation UH students, revealing the experiences and sensibilities of those born at the beginning of the 20th century and growing up in the early territorial period. These papers also lead us to speculate on the inception of UH’s sociology program and how the faculty became interested in collecting their students’ papers. The papers featured in this post are available in hard copy form and are filed in “RASRL Life Histories, Case Studies, Box 1.” UH’s Hamilton Library has Smith’s “Life Histories of Students, Selected Series” on microfilm. Some of the writers’ families were early arrivals to Hawai‘i and often well to do. Two papers among the Smith essays are quite likely written by a daughter and son of William Kwai Fong Yap (Chinese Female, “Life History of D.C.,” undated, and Chinese male, “Autobiography of D.Y.,” undated, Folder 2: Life Histories – Chinese). Older siblings of these established families often provided models for achievement and advancement. These writers had older brothers who were college graduates and employed in white-collar jobs or in the process of earning degrees.
. . . I will tell of my life as a self-supporting student. It is a hard, hard life. He must sacrifice hundreds of other things which he desires before he can get to his goal. First, he must satisfy his boss with his work. Then he must prepare his studies in order to keep up with others. Lastly, he must figure out how to pay his board, room rent, clothing, school books, and many other expenses necessary in the course of living. He denies himself many amusements, and postpones necessities even. The burden is always on him. It is an everlasting battle for survival. I recall my first year out working, when I was earning just enough to cover my room rent, board, and part of my school books. I had to go without lunch and had to do my own laundry in order to meet my monthly budget. One cannot realize the hardships unless he has undergone them personally (Chinese male, “An Autobiography of W.C.T.,” undated, Folder2: Life Histories – Chinese). Often the road to UH included a series of chance encounters. One writer became interested in Christianity, joined the Hi-Y Club, and attended the Y’s “Find Yourself,” a program that caused him to question his goal of attending commercial school. Like many other first-generation college students, he was greatly influenced by the Japanese Students’ Association, where he met UH students for the first time. Like many others during the 1920s, he also attended an Asilomar conference in Monterey, California. 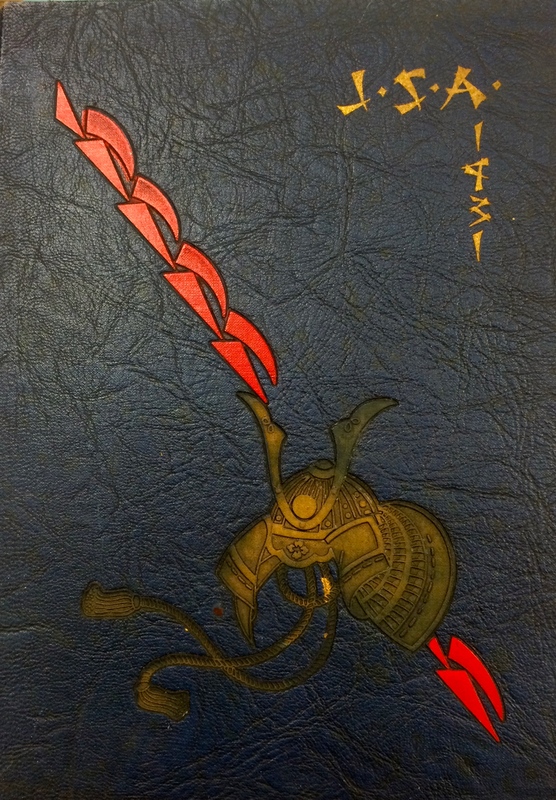 With his job at the Y helping with the boys’ clubs, he was able to pay his way through UH (Japanese male, “Autobiography,” undated, Folder 3: Life Histories – Japanese – Miscellaneous). 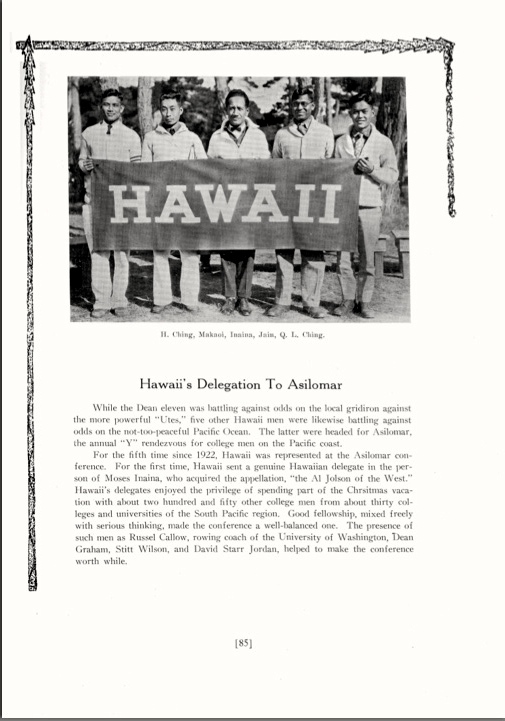 “The purposes of the Japanese Students’ Association are: to promote closer friendship, to interchange ideas, to encourage the pursuit of higher education among Japanese students of Hawaii, and to facilitate these students in fitting themselves into their American environment.” (Foreword, Students’ Annual of the Japanese Students’ Association, 1931). Like the writer above, many became involved in Christian organizations: the YMCA, the Young People’s Christian Endeavor Society, the Girls’ Reserve, the Honolulu Bible Training School, the Pocket Testament League. Sometimes teaching Sunday school led writers to decide on a career in teaching. RASRL writers in the 1930s and later often expressed their desire to complete their studies quickly in order to contribute to their parents’ income, pay back older siblings who often had sacrificed their own educations to help them, or in turn support younger siblings through school. Writers in the 1920s were no less anxious to get on with making a living for the same reasons. But some of them imagined futures outside of Hawai‘i. Writers who were aliens, either foreign born or holding dual citizenship, remarked, often ruefully, that they were ineligible to find good paying jobs even with college diplomas in hand. Some were resigned to going to Japan for employment. Chinese students, even those who were born in the US, proud of their citizenship, and self-proclaimed Americans in nearly every way, had a sense of duty and responsibility to what they called their “own language group.” Many planned to teach or preach in China after graduation. As mentioned previously, Smith’s interest was in Asian students’ experiences and attitudes. But among the Smith essays in Box 1 are four by Hawaiians, two men and two women. One by a young man born in 1902 in Hīlea, Hawai‘i is of special interest for his eloquence, sincerity, and perceptiveness. He opens his essay by stating that he has never had occasion to write about himself, but he will offer an account “based primarily upon the life history questionnaire submitted by Professor Smith and will be inclusive and concise as well” (“A Life History of A.K.K,” undated, Folder 6: Life Histories – Part Hawaiian). In my early years, I desired many things; some foolish and some good. I wanted to see the world, to get an automobile, to get a good education, to have lots of money, to have my own way, to be an athlete, to be a musician, and to marry someone outside of my own race. . . . Poverty, however, hindered me from getting all of these wishes. Working my way through school helped me in many respects. It gave me courage, self-reliance, frugality, good character, humility, and integrity. Moreover, I realized the value of education and the value of a penny. I did not spend money carelessly and foolishly as I had done long before. I realized that there was something better and more ideal ahead in life; that pleasures were not the only benefits in life. I have noticed this type [of Haole] right here in the University of Hawaii. They will never mix up with other students. They have a clique of their own. Outside of this, they have no regard nor respect . . .. I think that they are more immodest and more unwholesome than any other group. As time goes on, the use of the language will be more and more limited because children will tend to forget it on account of the training of English in the public and private schools. In order to know the history of the Hawaiian people in the most complete sense of the word, people must understand Hawaiian. They must be able to read the old books written in Hawaiian. Since Hawaii is under the control of the United States, I realize that I am subject to the control and influence of the Haole. By this, I mean that I would have to depend upon the Haole for my bread and butter. By so doing, I would come against social obstacles in the way of securing the positions I desire very much. I would have to take what they give me and say nothing. Since this is a small place, I would have to accept the best that can be offered for I have no definite choices of any kind to make. It has come to be a common occurrence for a Hawaiian or any other outside nationality to take a position inferior to that of the Haole. What can the young people do? I think it is very hard for them to do anything for the whole group. Individually, one can, by chance, secure the sympathy and admiration of the big men and thus be on a higher level than the others. The number of Hawaiians and Part-Hawaiians that are professionally independent is scarce. Through these papers we glimpse the early years of the Territory. Students had witnessed the First World War. Many were children of the initial wave of immigrants and grew up as first or second generation Americans. The Y and other Christian organizations as well as Japanese and Chinese cultural associations were powerful and pervasive influences in their lives. Those who struggled to get to UH and persist were the trailblazers who for the first time sat next to Haole in classrooms and often found themselves more than their equals. For women, teaching seemed to be the best career path and enrolled in the Normal School. (Of the 33 hard copy papers by UH students, all but 8 are by males.) For Hawaiians, the Overthrow was a mere generation ago and their sense of loss and mourning was deep. William Carlson Smith’s method certainly was a template for subsequent assignments made by Lind, Glick, and Hormann. The Smith project papers form the first critical mass of what would become the RASRL Collection. ← Who Was Zonita Owens?